Diesel fuel is a distillate fuel obtained from petroleum. It comprises a mixture of hydrocarbons, the precise proportions of which determine its volatility, density and viscosity. Diesel fuel is often also characterized by its sulphur content. By virtue of its thermodynamic efficiency, and consequently fuel efficiency, diesel fuel became the most successful fuel worldwide, being used in the engines of most freight trucks, trains, buses, boats, and farm and construction vehicles. It is also now used in many cars and small trucks and can power generators to generate electricity in remote locations or in emergencies. Early in the twenty-first century, with reports that diesel engines produced less damaging emissions than petrol engines, the number of private diesel cars increased, encouraged by tax-saving initiatives. With rising concerns about damaging CO2 emissions, diesel was heralded as a wonder fuel providing cost-effective driving whilst being eco-friendly. Indeed, by 2016, distillate fuel oil accounted for about 21% of total petroleum consumption for transport. However, in 2012 the dreadful truth about the devastating impact of diesel exhausts on health was revealed. The nitrogen oxides and dioxides and particulate matter in diesel fumes were identified as silent killers. The European Environment Agency reported that nitrogen dioxide from diesel exhaust had caused around 71,000 premature deaths across the continent in a single year. Diesel tax incentives are thus being reversed and strategies to reduce diesel emissions explored1. One option to decrease the emission of particulate matter, as well as elemental and organic carbon, is to blend diesel fuel with biodiesel. Blends of up to 20% biodiesel with 80% petroleum diesel can generally be used in unmodified diesel engines. It is thus distinct from the vegetable and waste oils that can be used to fuel converted diesel engines. 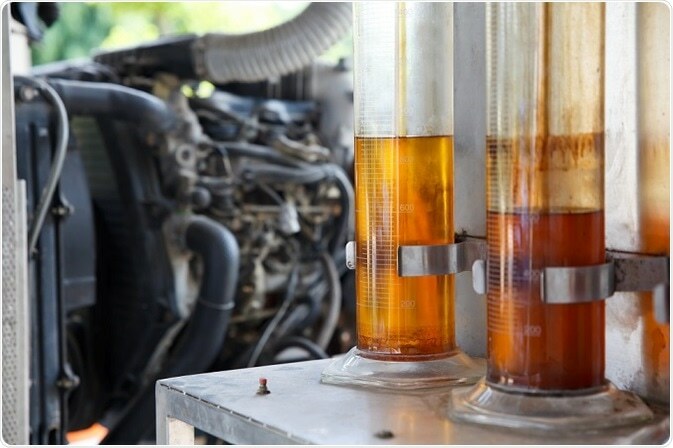 Biodiesel is derived from vegetable oil or animal fat and consists of long-chain alkyl esters. It is typically made by chemically reacting the oil or fat with an alcohol to produce fatty acid esters. Biodiesel has very similar physicochemical properties to petrodiesel, but is associated with reduced emission of pollutants, sulphur oxides and carbon monoxide. However, nitrogen oxide emissions with biodiesel are higher than with standard diesel. Biodiesel is designed to be used in standard diesel engines and can be used alone, or blended with diesel fuel in any proportion2. It thus represents a viable alternative to replace fossil fuels and lowers the risk of damage to health and the environment and reduces the demand on dwindling supplies of fossil fuels. Blends of biodiesel and petrodiesel are commercially available all over the world. With a view to meeting emissions targets, legislations are in place to increase the minimum proportion of biodiesel permitted in fuel marketed for standard diesel engines. In Europe, the goal is to reach a blend of 20% biodiesel by 20203. In order to enforce such legislation, it is necessary to be able to readily determine the proportion of biodiesel in a diesel sample. Several standard testing methods for determining the biodiesel content in diesel−biodiesel blends, mostly based on infrared spectroscopy, have already been introduced4. It has been proposed that such testing may be achieved more effectively using nuclear magnetic resonance (NMR) spectroscopy5. NMR spectroscopy is already widely used in the fuel industry for determining fuel properties and chemical composition. NMR analysis has the advantage that measurements can be fully automated and performed without the need for pre-treating the sample, enabling fast data acquisition. However, due to the expense and size of the sophisticated spectrometers required, a more affordable, robust solution is advantageous. A more cost-effective NMR-based analytical technique has recently been investigated for its potential to determine the biodiesel content in diesel−biodiesel blends6. Time domain NMR measures the time required for nuclei to return to equilibrium after excitation. It is widely used in industry for qualitative and quantitative analyses and is recognized as a reliable, convenient, rapid analytical methodology. It shows high reproducibility without the need for sample preparation and without sacrificing sample integrity. Furthermore, since the technique uses permanent magnets, it is relatively inexpensive, simple to use and do not require extensive cooling by liquid gasses. A novel non-destructive analytical method based on time-domain NMR has been developed that provides spectra showing a strong correlation with biodiesel content6. Measurements were acquired directly from fuel samples using a Bruker mq-20 NMR spectrometer with a permanent magnet. Both univariate and multivariate approaches accurately determined biodiesel content in diesel−biodiesel blends. However the reference Fourier-transform infrared spectroscopy provided more precise results. This new time-domain NMR technique has the advantage that it can be performed rapidly using readily available portable bench-top TD-NMR spectrometers. It therefore represents a promising tool for quick, cost-effective and convenient determination of biodiesel content in fuel samples. Stauffer E and Byron DJ. Alternative fuels in fire debris analysis: biodiesel basics. Forensic Sci. 2007;52:371−379. Knothe G, et al. The Biodiesel Handbook, 2nd Edition; AOCS Press: Champaign, IL, 2005. Directive 2003/30/EC of the European Parliament and of the Council of 8 May 2003 on the promotion of the use of biofuels or other renewable fuels for transport. In Official Journal of the European Union, 2003. Ferreira AG, et al. Biofuels. In NMR Spectroscopy: A Versatile Tool for Environmental Research; Simpson, M. J.; Simpson, A. J., Eds. ; John Wiley & Sons: Chichester, U.K., 2014; pp 257−272. da Rocha G, et al. Determination of Biodiesel Content in Diesel Fuel by Time-Domain Nuclear Magnetic Resonance (TD-NMR) Spectroscopy. Energy Fuels 2017;31(5):5120–5125.